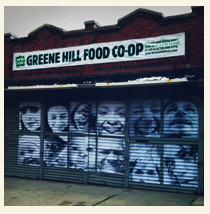 The Greene Hill Food Co-op welcomes new members who share the work and enjoy great prices on fresh organic and local food. Serving the communities of Fort Greene, Clinton Hill, Bed Stuy and Prospect Heights in Brooklyn, this good healthy social resource opened in 2011. Open Saturdays from 10am-2pm and Wednesdays from 6pm-10pm; store hours will expand as membership increases. Check it out! The website has recipes and co-op information.